Studying abroad gives you an opportunity to learn about new cultures and experience life in another country. This is a popular choice for college students in every major, from future foreign diplomats to passionate art enthusiasts. The major drawback to learning internationally is that it typically costs more than attending a local university. If you want to save money and still get the education of your dreams, you need a strong financial aid plan. Check out these scholarships for studying abroad, along with helpful application tips. If you need to take language courses before studying abroad, that will also influence your cost of living. Overall, think about all the expenses you would have at a local college, plus the cost of anything you need daily that you may not have overseas. If you have to stay in an apartment far away from campus, what will the cost of public transportation be? How much does food cost there compared to where you live? If you’re lucky enough to have a car, can you legally drive in another country? What will it cost to get a license or buy fuel over there? The answers to these questions and others will determine the true cost of studying abroad. There are many scholarships for studying abroad. They are designed to encourage students to study in other countries, and they are available for almost every major imaginable. Award amounts and eligibility requirements vary by scholarship, so you are sure to find a program that works for you. The Council On International Educational Exchange provides grants and scholarships for studying abroad. They offer merit scholarships for students with high academic achievements, as well as need-based grants for students in low income households. They also have special programs for students who study abroad in the summer. In 2018, they will offer a $2,000 guaranteed grant for students who attend a Minority Serving Institution. The National Security Education Program funds the Boren Scholarships for studying abroad. These awards range from $8,000 to $20,000, depending on how long the student will be studying overseas. The scholarships can be used at colleges and universities in Africa, Eastern Europe, the Middle East, Asia, Central Europe and Latin America. These are the areas the organization feels are underrepresented in study abroad programs. The Benjamin A. Gilman International Scholarship, funded by the U.S. Department of State, offers education assistance for students with limited financial means. Award amounts range from $3,000 to $8,000, with the highest dollar amounts going toward students studying foreign languages while in another country. This scholarship for studying abroad is only available to a limited number of applicants, but it could greatly reduce your expenses overseas. 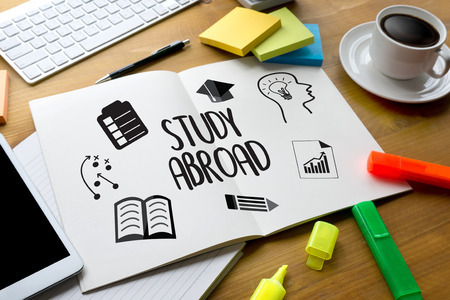 In addition to the scholarships for studying abroad mentioned above, you should explore the scholarships and grants available in your country of destination. Most countries have programs for international students to entice more people to learn in their schools. You could also check with the financial aid office at your desired university to see if the school itself has programs available. Before you move overseas, compare prices for living on campus (if applicable) and living on campus. Keep in mind that you will most likely not have a personal vehicle, so the place you live needs to be within walking distance to the school, food, work, and/or public transit. Some countries have student housing specifically for people studying abroad. The dormitories or apartments are complete with all household essentials, including furniture, internet, cooking supplies, and more. If you are only spending 6-12 months in another country, you may wait to come home until after your schooling is complete. Making a round-trip to the U.S. will be expensive, and it limits the amount of exposure you have to other cultures. Spend the holidays and other breaks in the other country and get the most of your time there. When you come back from studying abroad, you will have even more appreciation for your own culture and way of life.